The countdown to today has been on many sports fans’ radars for quite some time. 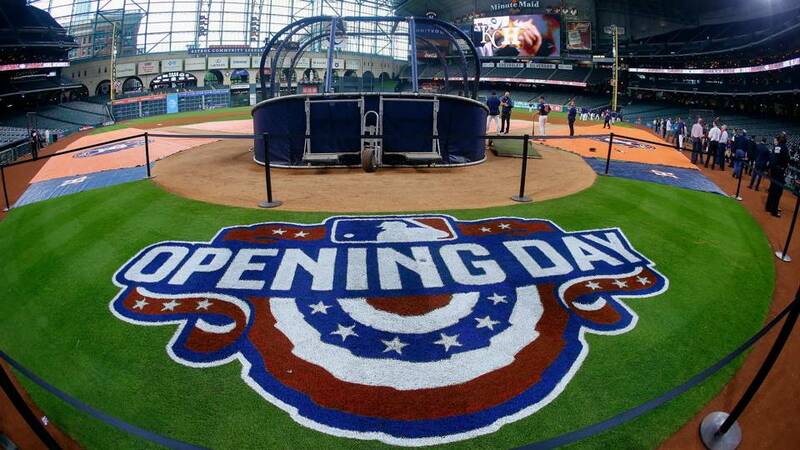 Ever since Dodgers SS Corey Seager hit a hard ground ball to Astros middle infielder José Altuve, we’ve all waited for that first pitch on Opening Day. The red, white, and blue hanging over the rails of ballparks across the country signals the end of an unforgiving winter and the joys of spring and summer. The Astros are coming off a historic World Series win, retaining most of their key young players. The Astros will be tough to stop, but winning championships in consecutive years is one of the hardest tasks in sports. Here are some of my unpopular opinions surrounding the upcoming MLB season. 1. The Yankees won’t win the American League or the AL East. As a New Englander, I was taught many lessons about my hometown professional teams. The ultimate lesson that every kid knew from an early age was that they had to HATE the Yankees. It’s like Christian Laettner and Duke, LeBron James, and the New England Patriots. Many dislike sports franchises because of how dominant they are. The Yankees were no different. The Core Four of Mariano Rivera, Derek Jeter, Andy Pettitte, and Jorge Posada, along with the rest of the late ’90s to early 2000s Yankees squad, dominated. Even though the Yanks won in ’09, it seems like the Bronx Bombers haven’t been near the Mount Olympus of baseball recently. The new addition of GM Brian Cashman has changed things up. He acquired slugger Giancarlo Stanton from Jeter’s Marlins for a laughable price. A lineup with Aaron Judge, Stanton, and Gary Sánchez will make most pitchers shake in their cleats. The biggest move in the offseason was hiring Aaron Boone as manager. Do you know who Aaron Boone is? Red Sox fans my age and older remember; we remember 2003 ALCS game seven in the Bronx with a lead in the eighth inning. We remember Sox manager Grady Little’s decisions to leave tired ace Pedro Martínez in the game. We remember Posada’s weak bloop single that drove in the tying run in the eighth. And finally, we remember Tim Wakefield’s floating knuckleball being smashed into the New York night by none other than Aaron Boone. Look, I’ll be honest here. I don’t care for the Yankees. That’s me being nice. Realistically, they don’t have the starting pitching that the Red Sox do. The Yankees’ lineup is up there with the Astros’ as one of the best in baseball. However, it’s pitching that wins championships. A quality seven or eight innings is always what makes the difference. Luis Severino as the ace is solid, but the other four guys are mysteries. Masahiro Tanaka has underwhelmed. CC Sabathia seems older than Adam Vinatieri. If the Yanks starters combine for an ERA under 3.00, they’ll win the World Series. I don’t care how much they can hit. If they can’t pitch effectively, they won’t win. Reliever Dellin Betances is also an x-factor. The 6’8” righty can absolutely fling it—consistently sitting in high nineties. However, he’s been inconsistent these past couple years. If he and Aroldis Chapman can find it and pitch a solid eighth and ninth inning, the Yanks have a good chance of beating the ’Stros. 2. Remember this name: Walker Buehler. Justin Turner’s injury will inevitably weaken the Dodgers. Like the Astros, the Dodgers are young and talented. One man who you won’t want to forget is RHP Walker Buehler. I first watched him when he was a Vanderbilt Commodore in the College World Series (CWS) against University of Virginia in 2014. Tyler Beede, Dansby Swanson, Carson Fulmer, and Buehler all headlined that CWS championship team and will play in the MLB this year, which is outstanding because of how recently they won. What impressed me about Buehler is not only his size and his dominant three pitches, but the easiness of his delivery. Fulmer looks like he’s deadlifting one thousand pounds when he’s pitching. Buehler barely looks like he’s putting in effort, but he’s touching the high nineties. Tommy John surgery seems like a requirement for pitchers nowadays. Fortunately for Buehler, he already had it. His eight games in 2017 yielded a 7.71 ERA—not good. He showed moments of greatness, though. He reminds me a lot of Adam Wainwright, which I know is high praise. That being said, it can’t be overstated how easy Buehler makes it look when he pitches. Even though Buehler’s curve isn’t as untouchable right now as Waino’s was, it does have a lot of bite. Buehler will likely stay in the bullpen for the beginning of the season, but come October, when the Dodgers will likely make a postseason run like last year, he will be right behind Clayton Kershaw as a second or third starter. 3. Stop complaining about baseball. This isn’t really a hot take, but please stop complaining about the MLB. In June, July, and August, take a deep breath, relax, and soak it in. There are few sports that only require you to crack a cold [refreshment] with buddies and enjoy the summer. Complaining is inefficient, and doesn’t accomplish anything. Sit back, relax, and enjoy baseball.